[PRESCOTT] – New Horizons Disability Empowerment Center was named a winner of the 2008 Alfred P. Sloan Award for Business Excellence in Workplace Flexibility today, distinguishing the employer as a leading practitioner of workplace flexibility in Arizona and across the nation. New Horizons Disability Empowerment Center was recognized at the Prescott Chamber of Commerce breakfast on Thursday, June 26, at St. Michael’s Hotel in Prescott. 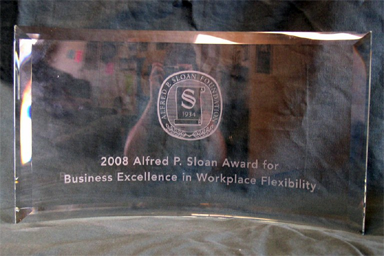 The Alfred P. Sloan Awards for Business Excellence in Workplace Flexibility are awarded as part of the When Work Works project,an ongoing initiative of Families and Work Institute, the Institute for a Competitive Workforce (ICW), an affiliate of the U.S. Chamber of Commerce, and the Twiga Foundation. Through When Work Works, these partner organizations provide research, resources, and recognition to employers nationwide, and share the results of research on creating effective and flexible workplaces that meet the needs of the 21st century. As an Independent Living Center, New Horizons is aware of the needs of people with disabilities, explained Executive Director Liz Toone. Many employees have some level of disability. As a result, the organization accommodates flexible scheduling to the greatest extent possible, inclusive of those employees who do not have disabilities, Toone said. Additionally, Toone said, New Horizons understands that job productivity is consistent with job satisfaction, so management accommodates staff needs, producing happier employees. New Horizons uses participatory management style. Managers are not afraid of rolling up their sleeves, and staff members at all levels are not afraid to offer suggestions or opinions, knowing that they will be valued. “Employers must develop new recruitment and retention policies. Unprecedented conditions — a multi-generational workforce, a shrinking labor pool and an increasing demand for skilled workers — dictate that they do so,” said Greg Roth, Senior Manager of Workforce Education Programs for the U.S. Chamber of Commerce’s Institute for a Competitive Workforce. Applications for the Alfred P. Sloan Awards were open to all organizations in the greater Prescott area with more than 10 employees that had been in business for at least one year. Applicants were evaluated in a rigorous two-step process, first comparing the employer’s application to nationally representative data from Families and Work Institute’s National Study of Employers, and then corroborating the employer responses through a survey of employees. Arizona is one of 30 select communities nationwide chosen to host and participate in the When Work Works initiative. Other communities participating are: Atlanta, GA; Aurora, CO; Birmingham, AL; Boise, ID; Brockton, MA; Charleston, SC; Chicago, IL; Dallas, TX; Dayton, OH; Durham, NC; Houston, TX; Lexington, KY; Long Beach, CA; Long Island, NY; Louisville, KY; Melbourne-Palm Bay, FL; Michigan (statewide) Milwaukee, WI; Morris County, NJ; Providence, RI; Richmond, VA; Salt Lake City, UT; San Francisco, CA; Savannah, GA; Seattle, WA; Spokane, WA;; Washington, DC; and Winona, MN. 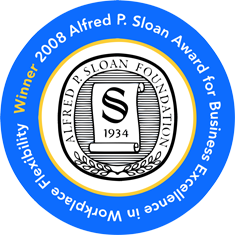 For more information about When Work Works or the Alfred P. Sloan Awards, please contact Shanny Peer at (212) 465-2044 x 224 or at speer@familiesandwork.org. New Horizons Disability Empowerment Center started its disability problem solving services in 1992, and in 1994, received a mandate and federal funding to serve people with disabilities throughout five counties of Northern Arizona. Our mission is to provide services and advocacy which empower and enable people with disabilities to self-determine the goals and activities of their lives. In order to serve people with disabilities, New Horizons Disability Empowerment Center offers independent living skills training, information and referral, peer support and guidance, accessible transportation in Western Yavapai County, Americans with Disabilities Act guidelines assistance, advocacy, community education, Arizona Technology Access Program, employment evaluation and training, and Work Incentive Planning and Assistance services. For more information, visit www.nhdec.org. When Work Works is a nationwide initiative to highlight the importance of workforce effectiveness and workplace flexibility as strategies to enhance businesses’ competitive advantage in the global economy and yield positive business results. When Work Works is a project of Families and Work Institute in partnership with the Institute for a Competitive Workforce, an affiliate of the U.S. Chamber of Commerce, and the Twiga Foundation, with funding provided by the Alfred P. Sloan Foundation. For more information, visit www.whenworkworks.org. Families and Work Institute (FWI) is a nonprofit center for research that conducts extensive research on the changing workforce, changing family and changing community. Founded in 1989, FWI’s research typically takes on emerging issues before they crest. The Institute offers some of the most comprehensive research on the U.S. workforce available. For more information, visit www.familiesandwork.org. The Institute for a Competitive Workforce (ICW) is a 501(c)3 affiliate of the U.S. Chamber of Commerce. ICW promotes high educational standards and effective workforce training systems, so that they are aligned with each other and with today’s rigorous business demands. Through policy initiatives, business outreach, and a strong grassroots network, ICW is finding solutions that will preserve the American workforce as this country’s greatest business asset and its strongest future resource. For more information, visit www.uschamber.com/icw. The Twiga Foundation is dedicated to inspiring, promoting and maintaining a family consciousness at home, in the workplace and in the community. The Twiga Foundation acts as a liaison to key stakeholders in the When Work Works communities to address the issue of flexibility in the workplace. The Foundation helps build a broader leadership constituency for workplace flexibility within each community. For more information, visit www.twigafoundation.org.